Every morning, the fine folks at Sports Radio Interviews sift through the a.m. drive-time chatter to bring you the best interviews with coaches, players, and personalities across the sports landscape. 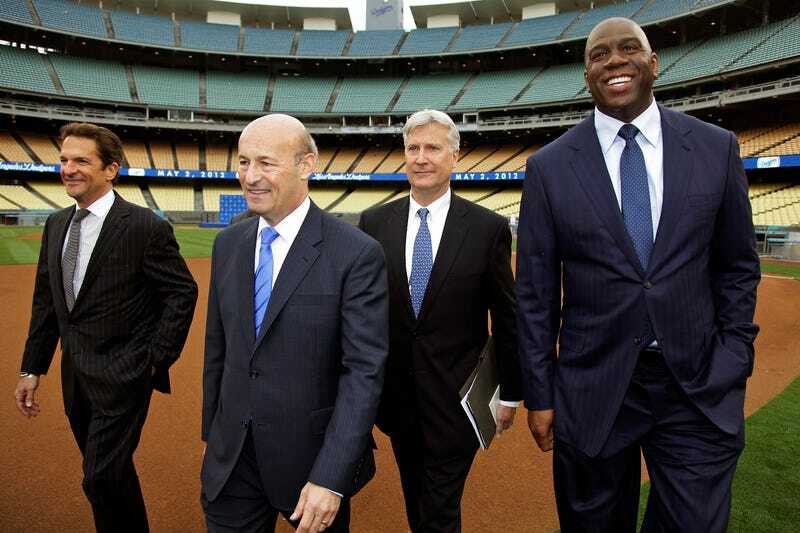 Today: Stan Kasten has all the money. Stan Kasten joined 710 ESPN Los Angeles with Mason & Ireland to discuss never believing the Dodgers would get the claim on Adrian Gonzalez, the blockbuster trade expanding beyond Adrian Gonzalez, the Los Angeles Dodgers salary budget and his new expectations for the Dodgers the remainder of the season. Did you think you were going to get the claim on Adrian Gonzalez? "No. We really did not. We had enough talk through that point of the season really that we thought if the claim ever came to us we'd be able to put a deal together, but at this time of a year a player like that is a very, very unlikely…people were claiming that because he is Adrian Gonzalez a team would block somebody else from getting him, so there was just too much standing in the way and I was actually out of town. I was in Colorado when I got the e-mail saying we got the claim. I was shocked and thrilled because I really did believe at that point that we'd be able to put something together." How did the trade expand beyond Adrian Gonzalez? "Well, trades are always sort of a process and a complicated one like this is a longer, more complicated process. Ned Colletti has been talking about like every team all the time and they often talk about Adrian [Gonzalez], but Adrian [Gonzalez] was never available. In July when all kinds of different discussions take place there were a number of things on the table in his discussion with Boston including different varations that might include Adrian Gonzalez. Right before the trade deadline we thought something had fallen into place and made a deal happen then, but it just didn't come together, so it went back-and-fourth and back-and-fourth and then in the last week I'd say they had more talks that led us to believe if Gonzalez was available they would do some things. We would do some things and it would all work. Here we are." Is there a salary budget or will you spend whatever it takes to win? "There's no number in my head, but obviously there are limits. We just want to do all the things we can and we are going to try to not to be dull about the things we do. We do need to rebuild this and we think the more energy and effort and resource that we dedicate to scouting and player development, the less need there will be in the future for deals like this. But for now to get us back to where we think the Dodgers should have always been we think we had to make moves like this. I think it's important to remember that none of the players we got do we have beyond the age of 35 or 36. We are not hamstringing ourselves to players who will be bad for 4 or 5 years…We don't think. Now who knows what will happen. That's our calculus that we are getting guys for most or all of their useful life and guys who can help us win while we take our time to rebuild a farm system that is frankly in need of rebuilding particularly internationally. We are doing those things as well, but we are not asking everyone to wait five years. We are just going to try to do this right now." Do you think the moves made over the weekend make the Dodgers a playoff team? Would you be disappointed if the Dodgers didn't make the playoffs? "I think it's more of a long term thing. But yes I think we should be in a position to contend. Let's face it that market we are in with the support that we have in this city, we should be in a position to contend every year and that's what we are going to try to do. I'm sure we should be contending. We should be making the playoffs or at least in the mix right until the end of the season. I'm not going to go crazy with expectations because we are here in the 27th of August, but we are making these changes. It's late in the day and if we made these changes in the offseason I would feel a heck of a lot better about our position, but we still obviously have a chance. We are just two games out of winning this division and a game and half out of the wild card, so we have a chance to get to the postseason this year and that's certainly why we did these things at this time because we wanted to give ourselves a chance for this season." This post, written by Steven Cuce, appears courtesy of Sports Radio Interviews. For the complete highlights of the interview, as well as audio, click here. • Adrian Gonzalez doesn't believe he'll be traded again. • Ben Cherington says this is just the beginning of big changes in Boston.